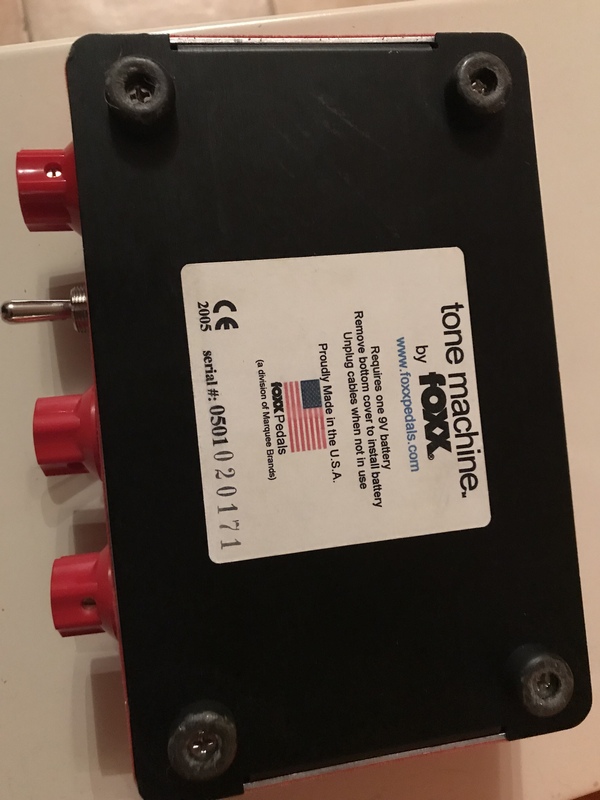 Tone Machine, Fuzz pedal from Foxx. 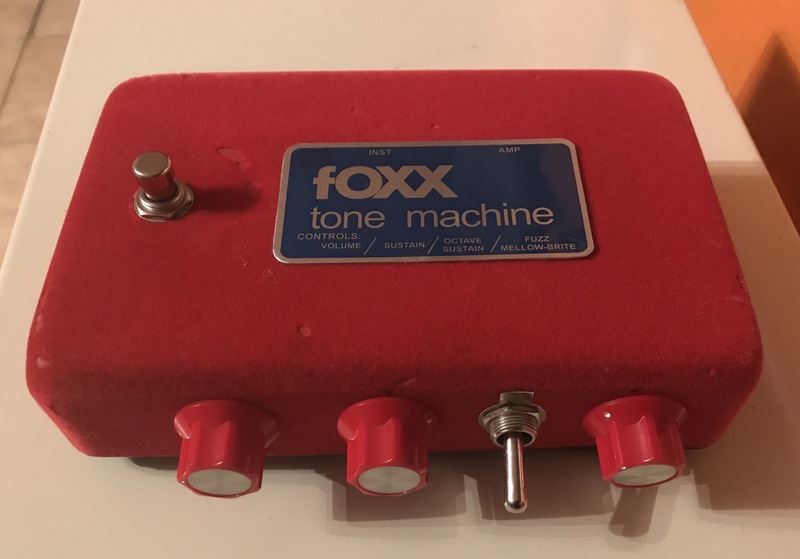 The Foxx Tone Machine is a fuzz box that was originally made in the early 1970's. The pedals were only made for a few years until recently when it was reissued. An outside engineer recently brought one of the reissues into the studio where I work and I was lucky enough to see it in action. The pedal has a unique shape, as it's somewhere in between a pedal and a desk top box. It's got 1/4" jacks for input and output, is powered by a nine volt battery, and isn't a rack mountable piece of gear. 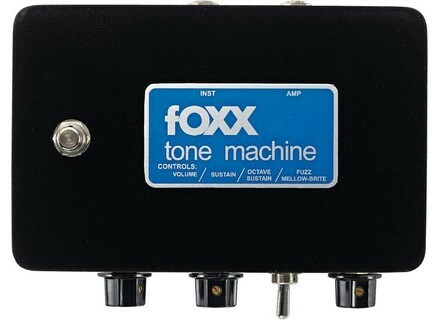 It's really easy to use the Foxx Tone Machine, as there aren't too many parameters that you will need to consider here. On the side of the box it's got knobs for volume, sustain, and fuzz. It's also got a switch for octave/sustain. I found it simple enough to use where I don't think any users will be reaching for the manual. 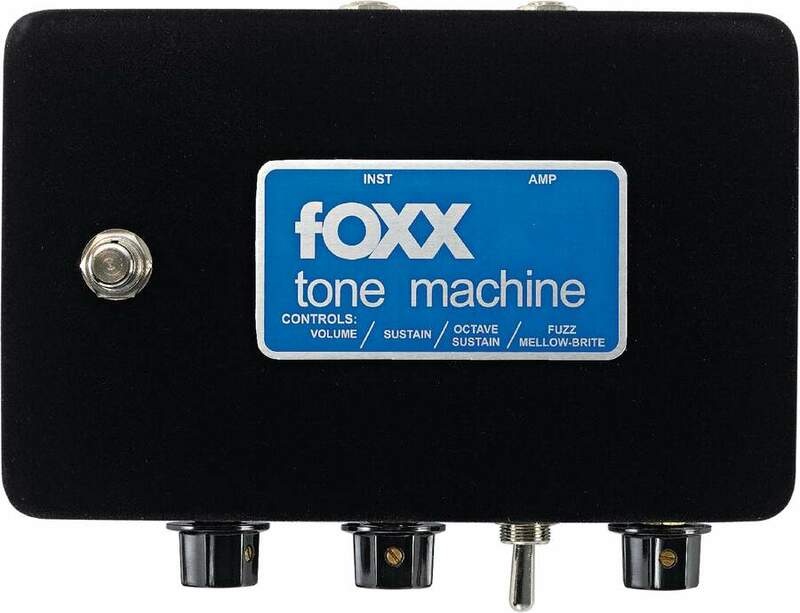 The overall sound of the Foxx Tone Machine is pure fuzzy goodness. The pedal has been used by a number of famous artists, including ZZ Top who I would most closely associate the sound of this pedal with. In fact, I'd go as far as to say that this is ZZ Top's tone in a box (if there was such a thing)!. It'll give you a super fuzzy, yet refined sort of fuzz tone where it's still possible to hear all the notes being played even though it's through a cloud of fuzzy haze. Before even knowing that ZZ Top used this pedal, the first thing I thought of when I heard the box was that sort of sound. The Foxx Tone Machine is one of the best little known fuzz pedals around. 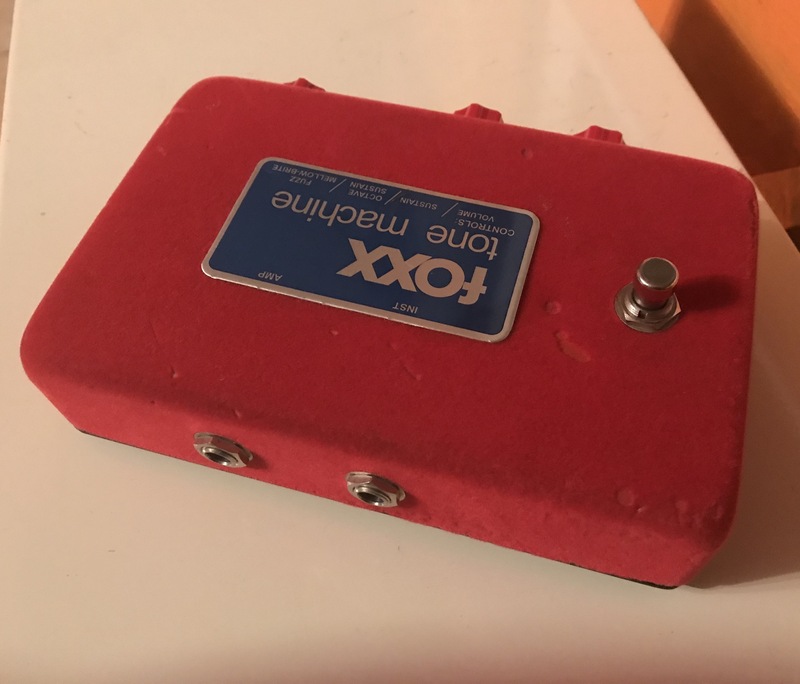 It isn't known very well since there was an almost 40 year period where these pedals didn't get made, but now that they are back I would hope they would come out to the fore front a bit more since they are such awesome fuzz boxes. It's possible to get some differing fuzz sounds, but it's definitely best for getting a classic, ZZ Top sort of tone. The pedal isn't cheap (especially considering it's versatility or lack thereof), but if you want a top tier fuzz pedal, the Tone Machine needs to be in the discussion. tontonrey's review (This content has been automatically translated from French)" The best Octafuzz!!" His Octafuzz the 70 original circuit, the fuzz or Octafuzz. 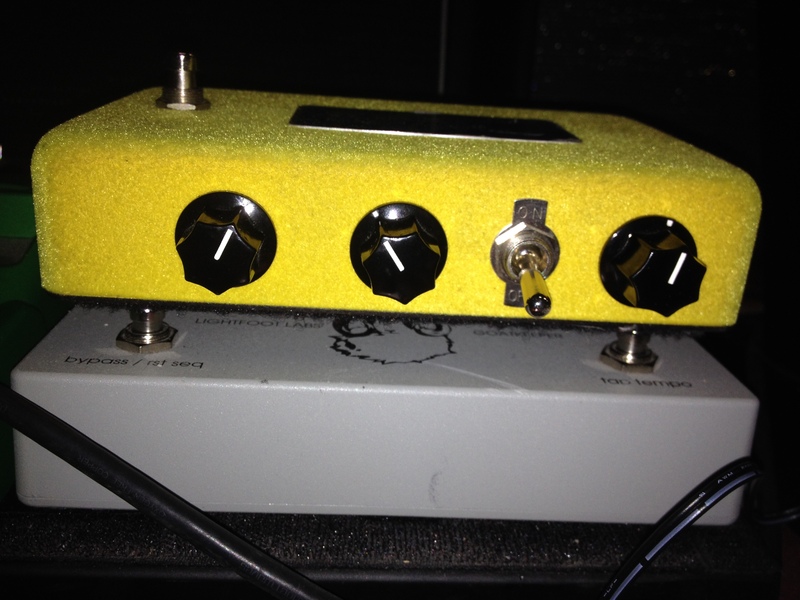 Analog, quality welds, quality components, resistors (rare), 3 knobs settings, 1 switch fuzz / Octafuzz selection. Simple configuration and its really good for fuzz. Most of this pedal is really Octafuzz a typical hendrixien sound of bands gypsis or genre pieces to kenny wayne shepherd, used by many guitarist in anéées 70. Realistic effect, I use it mainly for times jimi hendrix. The problem is that we want more disconnect!! I had several Octafuzz before, even tricobrahe octavia, I change it for anything in the world. Value justifiable price compared to the sound quality.